There is a great sense of terror and dread that only farriers know: what started out as a perfectly good hoof shape suddenly gets away from you and you can’t bring it back to normal. This is often a result of the flawed perspectives that farriers are trained to use while assessing horses’ hooves – to look at them while they are standing or in motion, which is good. However, the accuracy of the assessment while they are on three legs with one of them in the farrier’s hands is, at best, difficult. This is not so good for the horse, nor for the farrier, to obtain a consistently accurate reading of the hoof geometry. Shaping the hoof from the ground surface or from underneath is what we are traditionally taught. We are also taught to then rasp the outer wall so that the flares are removed. The horse is then left barefoot or shod. 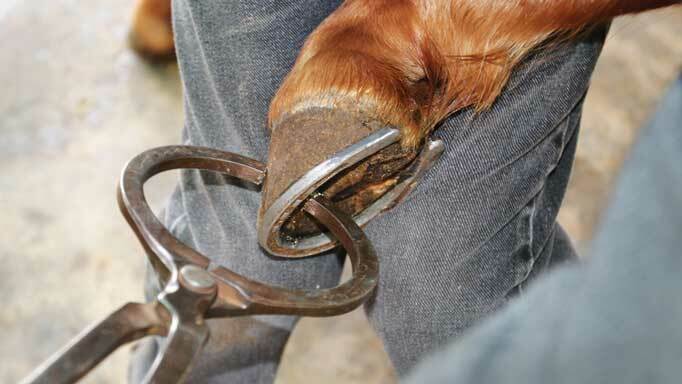 Several things will happen if a hoof is left unshod (such as when they are pulled after the show season to give the feet a “break”). First, as a result of the hoof moving through its environment and being subjected to whatever abrasives lie in its path, the natural “trimming” never stops. Only the hardiest-footed horses with exceptionally straight limb flight patterns can continue to grow hoof on severe surfaces without incurring some form of asymmetrical wear. Barefoot horses require very large pastures to move about in, as this allows for more straightforward motion and less circling.The breakover is then more or less in the middle of the hoof, which encourages the front of the hoof to wear evenly on both the outside toe and the inside toe. 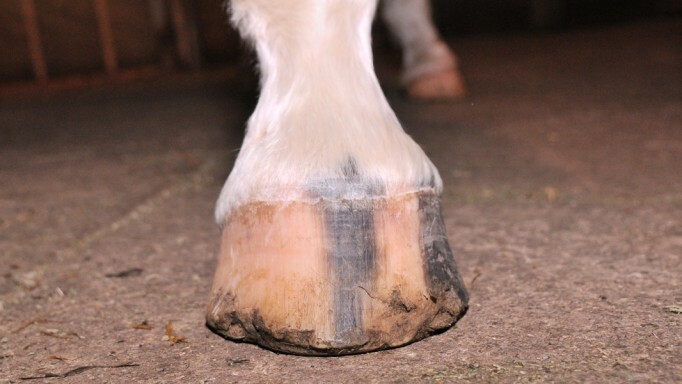 This will help maintain the hoof’s symmetry – even on horses whose legs deviate from dead straight. Barefoot horses turned out in small paddocks don’t have the luxury of prolonged straight line movement. They are constantly turning and this causes the hoof to wear more on the outside toe, which in turn makes the inside toe more prominent. This little point on the inside toe sets the hoof up for all kinds of scenarios. This is a pivotal radius and as such can cause counter-rotation of the limb as it lands on the ground. The hoof can actually “screw” itself into the ground and subsequently have to screw itself back out before it can leave the ground. This counter-rotation adds a significant added strain to the limbs. Those horses that have angular limb deformities such a offset (bench) knees or varus or valgus joints (inward or outward bend) will find that they have difficulty maintaining a good symmetrical and supportive hoof shape. At this point the farrier is summoned and instructed to nail on a pair or a set of shoes to rectify the limb deviation or uneven hoof wear. As per the owner’s or trainer’s instructions the shoes are nailed on and old Dobbin is pressed back into service. 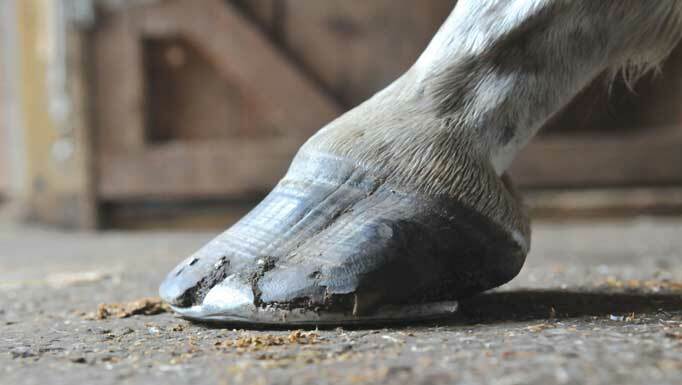 The problem of the unevenly worn-down hoof is now that the wonky foot gets longer and all the forces that were undesirable while barefoot are going to become magnified due to the added length of the hoof. In most cases about 8 mm is added to the hoof length immediately by the addition of steel. This is going to become 16-20 mm overall length before the shoe job is refreshed in a month or six weeks. So with all the uneven strains that were present before the shoes went on, we have now magnified those issues. “Why not put on thinner shoes?” you ask. Unfortunately, anything less than 6 mm may not have the capability of withstanding the torque forces of turning and jumping. Remember that this is a starting point for shoe wear; they will get thinner and eventually fail while the torque strains on the hoof are causing it to crack, flake, chip, peel, bend, and tear. Let’s say that Sadie, a lovely Thoroughbred, is showing in the children’s hunter division. But her shoes are getting loose too soon; her feet are cracking and splitting and the walls are flaking. Then a couple of shoes come off in quick succession. Fortunately, at one of the horse shows the farrier is there. He says, “Oh sure, just bring her in and we’ll take care of that,” all the while knowing that this could ruin his reputation if it all goes horribly wrong. This horse has virtually nothing to nail to. The toes are too long, but the soles are so flat that there is absolutely nothing that can be safely trimmed from the bottom of the foot. “Oh, by the way she’s in the next class over fences and we don’t mean to rush you or anything, but they’re pinning the last class and we will try and get her moved down in the order. Do you think she will be alright to do just one more class over fences and then there’s just the hack?” A deep sigh emanates from the show farrier. Two nails are missing and one is half out and bent over, which leaves the farrier with five existing nail holes to work with. The first nail the farrier drives dislodges a flake of wall horn the size of a corn flake. The next one splits the wall and only comes out about a quarter of the length of the nail high (most nails are between 50-60mm in length). The farrier in this scenario is me, but I had been on the lookout for a classic wreck to come along. What followed was as dramatic a makeover as ever I have done. The toughest cases really are horses with perfectly ordinary feet. The hardest thing a farrier can do is to be obliged to care for and maintain a sound, healthy foot. Truly damaged feet are a piece of cake to fix. Restoration of a hoof is often as simple as filing it smooth, dressing the wall and coming back to repeat the exercise every three weeks, while allowing the foot to grow out the old nail holes and just be kept in a state of refinement. This isn’t always possible with show horses, because there are numerous agendas taking place simultaneously. Hoof horn that is perforated with nail holes can be extremely difficult to keep intact. Shoeing intervals of less than five weeks generally cause excessive wall splintering. It is important to have a solid plan for solid feet. Barefoot trimmer, Anne Riddell, explains, it’s not just a matter of forsaking the shoes. 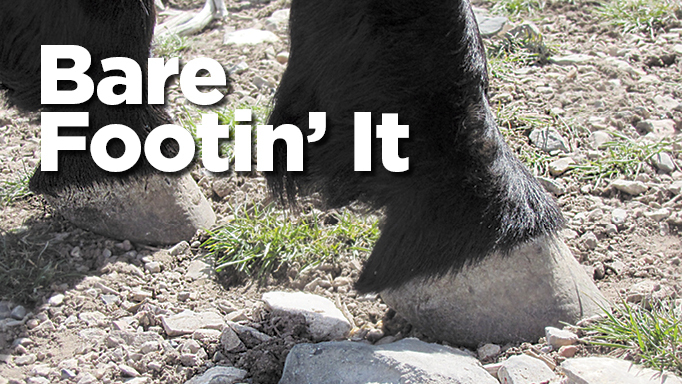 Get expert advice on whether to remove your horse's shoes for the winter or not.